Six public forums were held around the state in March and April 2016 to provide more information on the plan development process and receive suggestions and ideas from interested stakeholders. The forums were held at the locations and venues identified below, and were free and open to the public. The forums followed an open house format with informational exhibits and project team members available for one-on-one and group discussions. An informational presentation about the energy plan and planning process was given at each meeting. Citizens were encouraged to come, meet the plan development team, and provide thoughts and opinions. View the handouts provided at the public meeting. 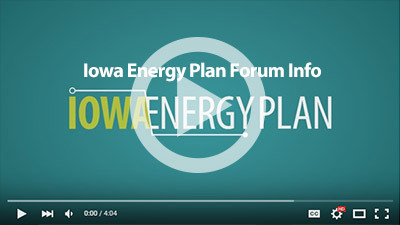 Additional materials that were prepared for the Iowa Energy Plan can be found on the Resources page. A summary of the public forums was prepared and is available. Learn more about what people had to say.